Let's show some love for the great state of Alabama! 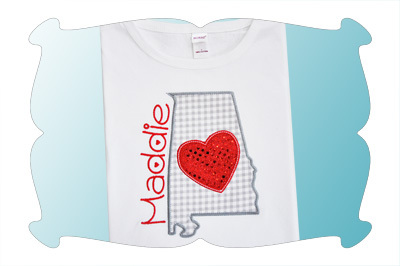 Featuring a state of Alabama outline applique with a heart! State of Alabama outline with a heart! The embroidery font shown (the name Maddie) is available as a separate purchase. 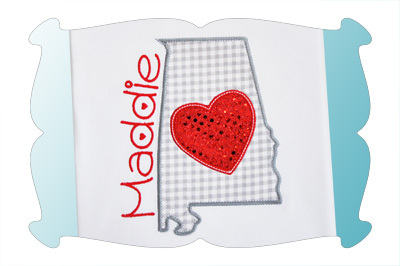 The "Alabama Love Applique" design comes in 4 sizes. All sizes included with your purchase! 4x4: 3.91 x 2.48. SC: 5189. 5x7: 4.33 x 6.88. SC: 9100. 6x10: 5.32 x 8.49. SC: 11,476. Durkee 9x9 Hoop: 4.57 x 7.28. SC: 9561.